Flo and Frankie Pineapple-This is no longer coming up online so I'm guessing it may have sold out now. This little pineapple is adorable and when it was on sale recently, I had to order one for myself. The gold leaf detailing actually leans more rose gold in person which I like. This is by no means an essential but I just thinks it adds a bit of pizzazz to my room+bedside table. Urban Decay Naked 2 Basics-Matte shadows were never something I felt like I was missing from my collection, until I realised just how ridiculous shimmery shadows look in the crease. This palette is perfect and aside from the brown-black shade on the end, I use these colours most days. It's such a versatile palette and the colours apply so smoothly and don't look chalky. Love. Australis AC/ME Eyeshadow in Bronzonce-If you want a cheaper alternative to the Stila Magnificent Metals eyeshadows, then this is your guy. These apply like a cream then set down to a powder finish and last pretty well, with or without primer. Bronzonce is very All That Glitters-esque. I love it! These are limited edition I think so I'm going to have to grab myself a backup. Nars Audacious Lipstick in Anna-Where do I begin...the name, the packaging, the colour-it's all amazing. This colour reminds me of Mac Syrup but a smidgen darker. The finish looks matte but it applies creamily and sits nicely on the lips. The colour lasts pretty darn well too. I'm tempted to get the shade Grace next but if you have any recommendations then sing out. Oskia Renaissance Cleansing Gel-Confession time: I've been very neglectful when it comes to skincare and my skin's certainly rewarding me at the moment *ahem*. One product I do notice making a huge difference is this. Part gel, part oil it breaks down any makeup you have on and leaves your skin feeling so clean. Seriously, I always notice how much nicer my skin feels when I use this. On that note, I need to wash my face more often. 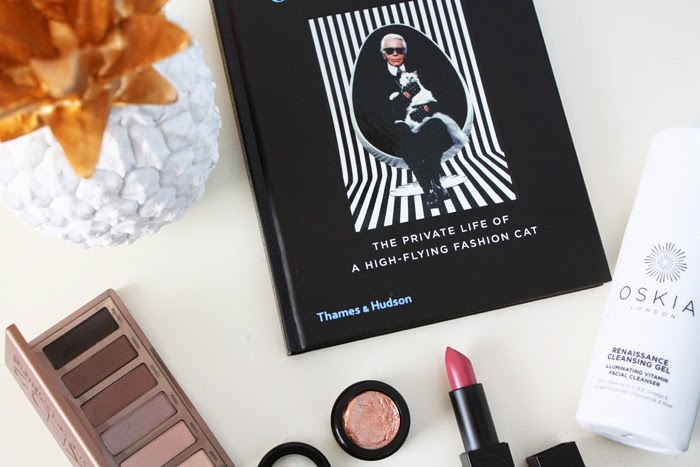 Choupette: The Private Life of a High-Flying Fashion Cat-Not a lot of reading got done in December but one book I did manage to get through quite quickly was this one. Choupette has to be one of the cutest celebrity cats out. Her owner is Karl Lagerfeld so it's safe to assume she lives quite fabulously. This is a fun, coffee table book with insights on cats and Choupette's favourite things but it is also crammed with incredibly cute photos. If you're a cat lover and a fashion lover you need this. -What have you been loving in December? Just started using Oskia Renaissance Cleansing Gel. Still using the Oskia Perfect Cleanser at night but the gel is lovely for brightening my skin in the morning. It's more of a balm. Lovely stuff! Love the scent!